Good technical communication starts with good writing. All documents then need a thorough edit. Good indexing also adds a lot to technical documents. With tools likes FrameMaker, WebWorks ePublisher, and Madcap Flare doc sets become powerful. Online Help, PDFs, even ePub files can be created from the same source. Documents can then be localized in a sophisticated pipeline. Multimedia wizards who designed the latest Madonna world tour and her Superbowl appearance, the new multimedia installations blanketing the Los Angelas airport, among other high profile global projects. I was in charge of the localization of their X-Agora multimedia software, and the localization and updating of the corresponding technical documentation. This involved close coordination with Moment Factory and outside experts, building from scratch a localization pipeline, the publication of many new documents for end-users as well as to use internally, and many other interrelated tasks. 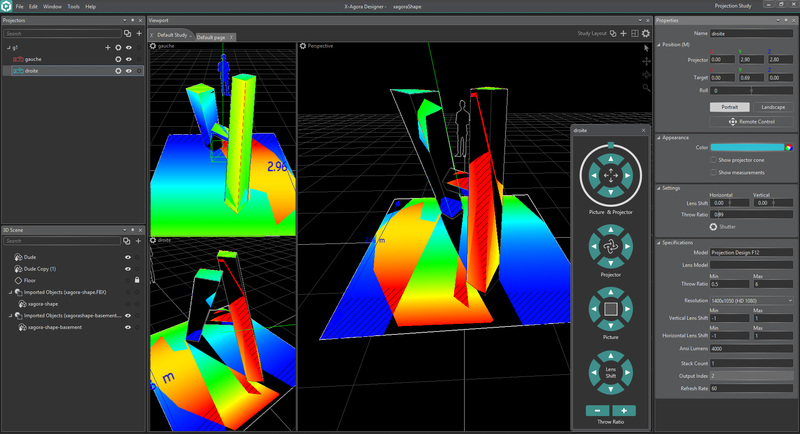 X-Agora is like an evolution of a lot of other software I have worked on: combining whole artistic and technical disciplines: audio, animation and simulation, lighting, stadium-sized video, live interaction, 3D projection, etc. For a taste, think about the following typical X-Agora scenario: Import fully textured and lit 3D models from 3ds max, add interaction using the integrated Max/MSP module (a powerful audio-based interactive software in its own right), add even more interaction using Lua (an increasingly popular game-oriented language created in Rio de Janeiro), add particles and other simulations, then calibrate 3D projection using real world architecture, and don't forget X-Agora is all built upon an open-source game engine called Ogre 3D. For more information, visit the X-Agora wiki. World's leading design software firm with a lock on the highest-end 3D and film & video postproduction software worldwide. Over a many-years stint at Autodesk, I wrote the technical documentation for many of the key features for their Advanced Systems including Flame and Smoke. I covered such features as offline-online workflow, keycode (film counterpart to timecode), morphing, colour correction, animation, keying, etc. I also worked across the organization including in their 3D department and video encoding solutions—heading an initiative there with teams in India (Bangalore), the USA and Canada. Autodesks's Flame, originally put out by Discreet Logic, is the premier high-end film and video compositing system on the market. With powerful node-based special effects, real-to-real editing and online realtime processing, chances are the Hollywood films, music videos, and commercials you are watching passed through Flame at some point. For more information, visit the Flame website. Smoke is the top-of-the-line finishing system on the market. Meaning full length clips, shows, and movies move through a package like Final Cut Pro for a rough cut before being finalized on Smoke, with the high priced director and/or DP often present along with the online editor. Smoke features a multi-layered timeline and realtime processing for up to hundreds of layers simultaneously. For more information, visit the Smoke website. Autodesk now has a virtual monopoly on the 3D design software used to design video games, model architecture, and generally for any design work requiring depth. From animation and kinematics, to particles and other types of simulation, to lighting, rendering, and on up to complex visualization pipelines, much of the world is now reliant on the 3D component of Autodesk's offering. For more information, visit the 3ds Max | Maya | SoftImage websites. Physical security company developing software to control and manage the security systems for some of the world's most sensitive places, such as the city of New York, the Paris and Dubai airports, among many others. At Genetec I was in charge of the documentation for their Omnicast and AutoVu software/hardware products. I also modernized their technical communication pipeline, installing new software, developing new templates, adding rich features, and automating the production pipeline using such products as WebWorks ePublisher and the latest version of Adobe FrameMaker. Omnicast is an IP-based software that controls the surveillance apparatus of some of the world's most sensitive places. Omnicast provides an interface to industry leading PTZ cameras, advanced UI options for all levels of security personnel to monitor and switch cameras in even the most demanding environments, to full archiving capabilities. The system can also be federated to other Omnicast systems to provide city-wide, or even larger scope surveillance. For more information, visit the Omnicast website. Licence plate recognition (LPR) is essentially a kind of machine vision which in turn uses optical character recognition (OCR) to read license plates from moving and parked vehicles. The software component of AutoVu has numerous types of implementations, from capturing offenders on international most wanted lists in getaway cars, to elaborate map-based parking enforcement schemes which integrate with Google Earth. Genetec manufactures all the hardware and develops the corresponding software for the AutoVu system. For more information, visit the AutoVu website. Network performance monitoring for the word's biggest telecom players and data centers. I totally modernized their huge documentation set — converting 3000+ pages of LaTeX-based content into FrameMaker-compliant DITA using the proprietary plugin DITA-FMx and through an automated process I designed. I also wrote and designed many new long documents for Watch4net, covering a very complex modular software which ran on virtually all operating systems, including multiple flavours of Linux and Solaris. APG is Watch4net's network performance monitoring solution used to ensure the speed and reliability of some of the world's top networks, like Swisscom, British Telecom, Telefonica, Bell and Videotron in Canada, and is even used to monitor Microsoft's own systems, as well as for those affiliated with the US Army. APG has been integrated into overall network performance solutions offered by EMC. For more information, visit the Watch4net website. Throughout my career I also worked in television, for several highly trafficked websites, as well as further technical communication work. I ran the most widely trafficked legal website in the world, at www.canadavisa.com, as Communication Manager for CanadaVisa/Campbell Cohen. At this position, I also managed and doubled the frequency of their now bi-monthly newsletter CIC News. I wrote a lot of articles for these sites/publications, including one I am particularly happy with about Canadian immigrants who became international music stars called Singing an Immigrant's Tune to Success. Additionally, I was in-charge of all their social media assets, including the redesign of their Facebook page, and helped with the development of their mobile apps on iOS/Android/Blackberry. I worked as a writer/producer for all of the many television shows put out by World Affairs Television and seen across Canada and the United States on CBC and PBS. Visit the World Affairs website for a breakdown of their programs. I was hired several times to work on the technical documentation for North America's leading digital jukebox provider which handles sophisticated hardware and software deployed at over 50,000 bars and restaurants across North America. Visit the TouchTunes website for more. I created from scratch and managed several writers, quality assurance and production workers, producing a full documentation set for this US/Ontario based telecommunications company. Visit the Avotus website for more. I created from scratch a full documentation set for this Ontario based logistics company. Visit the Edisoft website for more. I cut my technical writing teeth working with former employees of Softimage on the now defunct Web 3D software AXEL. Check out the first user guide I ever wrote for this software!